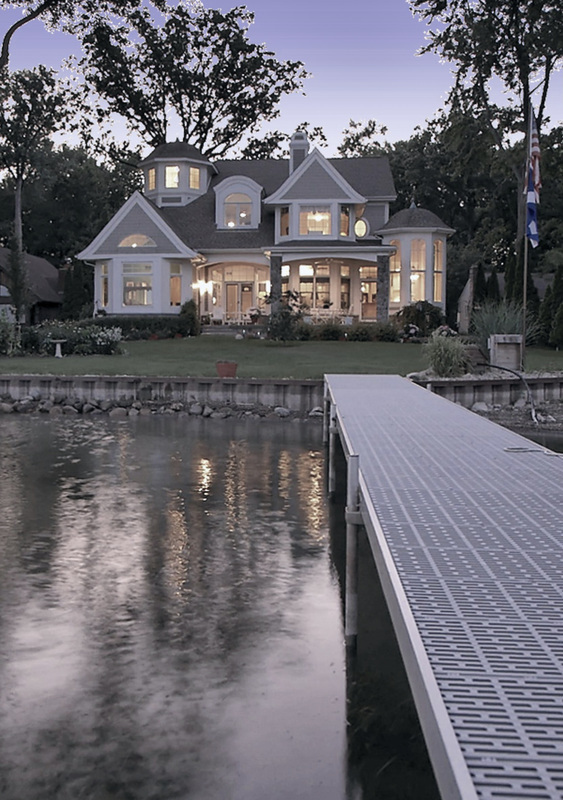 This Cape-Cod-inspired lake home, with authentic Shingle-style detailing, was designed for casual living and easy entertaining, and to capture the breathtaking views of the lake on which it is sited. 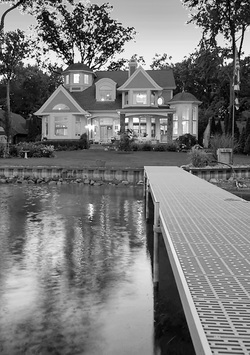 As the lake lot is long and narrow, with existing homes built very close on both sides, the primary design objective was to design a home to direct views to the lake, while creating privacy from the neighboring houses. ​Expansive windows and French doors facing the lake allow beautiful view lines to the lake and enable natural light to flood into these rooms. Utility rooms and secondary spaces are arranged to block views of the neighboring houses. The floor plan is very open, so that the spaces feel more expansive, and the primary interior rooms flow together and are integrated with the outdoor living areas and directed views to the lake. 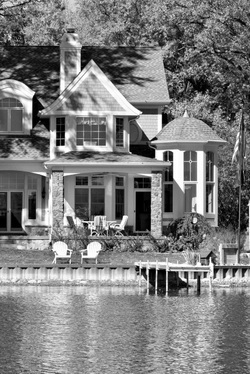 Playful Shingle-style elements were incorporated into the design, such as the unique 35-foot tower room, which captures panoramic views of the lake, and creates a bell-tower architectural element on the exterior. The casual morning dining room is set in an alcove off the kitchen and creates a second bell tower architectural element. Charming Cape Cod Shingle-style design elements were carried throughout the interior detailing and material selections, as well as the exterior of the house. "This contemporary Prairie-style home, designed and sited to relate to its environment, was the most popular choice among readers who voted for Best Overall Home....from among 12 worthy options. 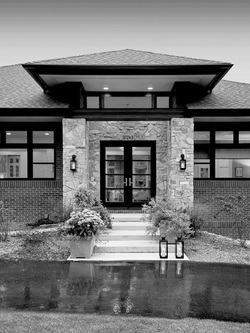 In creating this residence, VanBrouck & Associates embraced the tenets of Prairie style while adding contemporary elements." The lot was challenging, sloping to the right and falling off at the rear into a marshy, protected wetland area. ​Strong vertical lines of natural, rough-cut stone anchor the home to the earth and intersect the strong horizontal lines articulated by the low-pitched hipped roof, wide overhanging eaves, and the banding of windows. 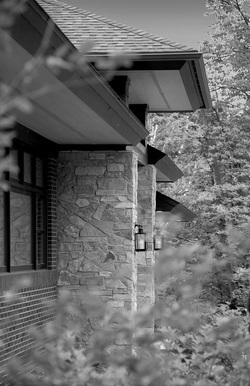 ​Soffit lighting in the eaves highlights the organic texture of the stone when lit at night. Daylight streams through the large windows, furnishings and materials are modern, and the color palette is light and neutral. ​The kitchen of this home is the modern interpretation of the “hearth”, where the family gathers. Designed as one large space, a comfortable sitting/ living area and the casual dining alcove integrate with the spacious, modern kitchen. Stone from the exterior was brought into this space and installed on the custom range hood, and the entire east wall, to integrate the interior and exterior spaces. A large living porch, at the rear of the house, with retractable-screens to protect from insects, extends the indoor living space and allows expansive views of the beautiful, marshy wetlands and wildlife. 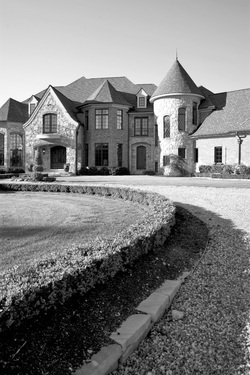 This French-chateau-inspired home, approached from a mile-long, winding private road, is beautifully sited on extensive acreage. The plan for siting the house, inspired by the landscape plan of Frederick Law Olmsted for the Biltmore Estate in Asheville, creates an approach road that winds through beautiful, natural meadowland and forest. 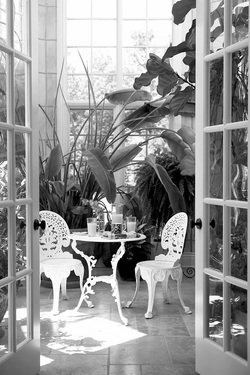 While the house is surrounded by extensive, manicured landscaped gardens, including a kitchen garden, with future plans to plant a vineyard, the area further from the house is allowed to be natural to support botany, forestry, and wildlife, and for beautiful walking trails through the woods. ​The house is extended over a large footprint, suited for the extensive grounds. A 3-car garage is attached to the home, with an additional 4-car garage attached by a horse-carriage-style porte-cochere, allowing the garage doors to face to the rear motor courtyard, and further elongating the overall footprint. The home features many French-country-estate spaces including a true conservatory, wine cellar and tasting room, and large dining and gathering spaces. 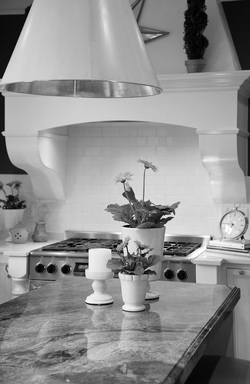 The Provencal-style gourmet kitchen supports multiple gourmet cooks and is a delightful space to prepare for entertaining. The home also features five bedrooms, “her” office, “his” library, an exercise room, a media/ theater room, a beautiful formal staircase in the foyer, and a secondary staircase set in a round turret. 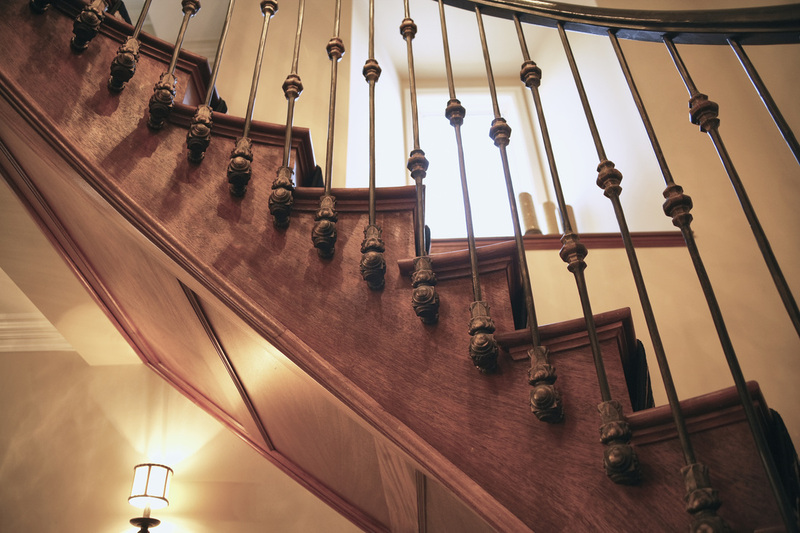 Authentic old-world materials are used throughout the architecture, including French tumbled limestone floors, wide-plank wood floors, timber beamed ceilings, wrought-iron stair railings, and stone interior walls. This contemporary Prairie-style home, beautifully designed and sited to relate to its environment, embraces the tenets of Prairie style, while being firmly rooted in this century. While the exterior building materials were chosen to reflect an authentic Prairie style, the interior is light, bright, and contemporary. ​​Daylight streams through the large windows, furnishings and materials are modern, and the color palette is light and neutral. The kitchen of this home is the modern interpretation of the “hearth”, where the family gathers. Designed as one large space, a comfortable sitting/ living area and the casual dining alcove integrate with the spacious, modern kitchen. This 3,000 square foot addition was designed to complement the existing 6,000 square foot contemporary Prairie-style-inspired residence. The addition is seamless, with exacting attention given to perfectly matching the original brick, and blending the simple linear lines, deep-overhanging eaves, and extensive porches of the existing and new architecture. A home theater/ club room was designed for hosting football parties, poker nights, movie nights, and specialty events. It features a state-of-the-art, surround-sound, media entertainment system with a built-in television and 132” drop-down projection screen, and electrically-controlled room darkening shades to create the ultimate home-theater experience. Custom and exquisitely-detailed, walnut-stained millwork creates the ambiance of an English gentleman’s club room. 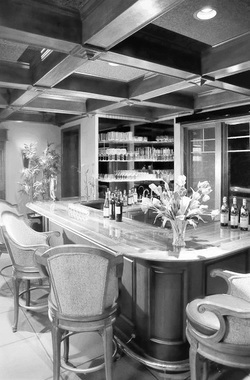 The resort-style bar in this club room is custom milled with a high-gloss epoxy walnut countertop with built-in custom cabinetry to accommodate an under-counter refrigerator, ice maker, fully-stocked bar, and storage for easy entertaining. ​The paneled, coffered ceiling creates a grid system to accommodate the surround-sound acoustic ceiling fabric panels, while the panel millwork on the walls incorporates speakers and a hidden panel to access the electronics. 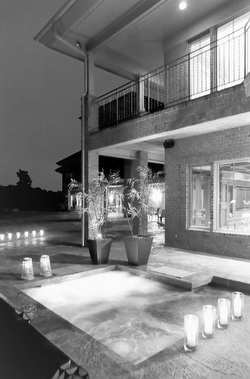 The addition also features an exquisite resort-style spa room, equipped with a professional massage table, pedicure station, and a large steam room, as well as a private bath with shower and dressing area. The space is exquisitely beautiful with Sicis Italian glass mosaic tiles installed on the floor and walls to create an upscale and tranquil ambience. The visual focal point of the spa space is an exquisite lotus-flower mural of Sicis glass mosaic tiles installed on the entrance wall of the spa. 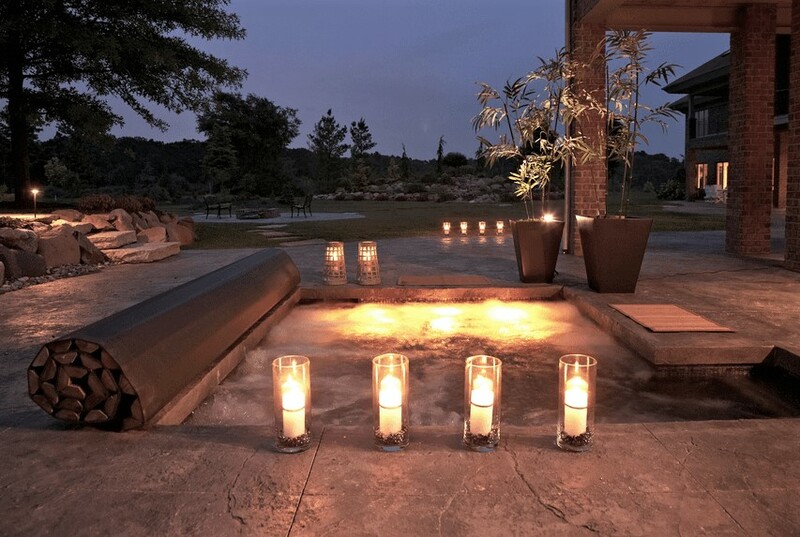 French doors open directly to a tranquil, secluded Asian-inspired meditation area of the 100-acre-garden landscape that surrounds the property, and to an Asian-inspired hot tub which creates a place to interact with the natural environment. The addition also accommodates two large guest-bedroom suites, each with a luxury ensuite bathroom with jetted tubs, large showers, and coffee-bars. 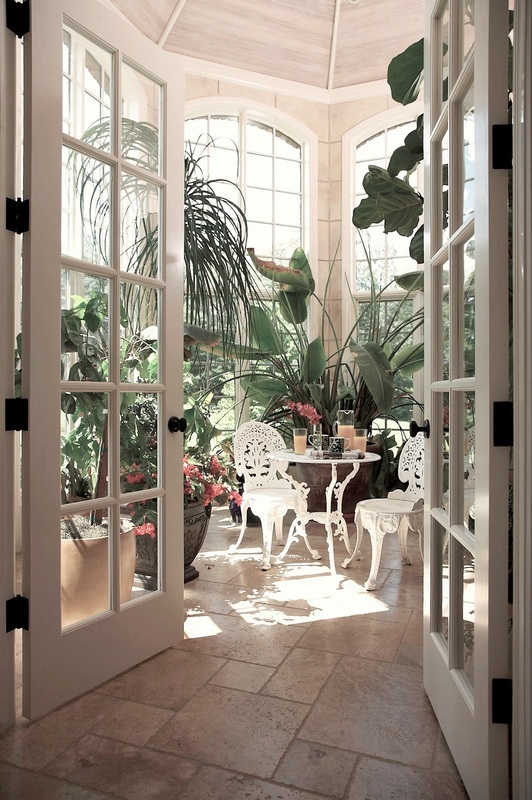 This space was designed to be both aesthetically beautiful and to function as a true conservatory to enable the client, an avid gardener, to bring plants from outdoors into this indoor sanctuary to survive the severe Michigan winters. 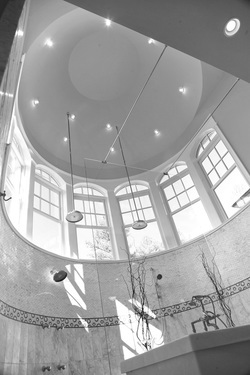 It features a soaring 18’ ceiling to allow plants to grow unimpeded as well as temperature and humidity controls separate from the main house. 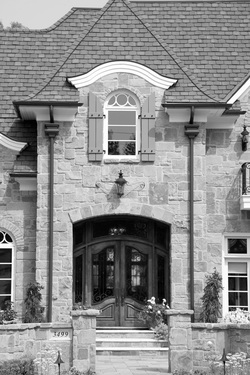 The structure creates a turret on the southeast elevation of the residence, consistent with the French Eclectic architectural style of the house. 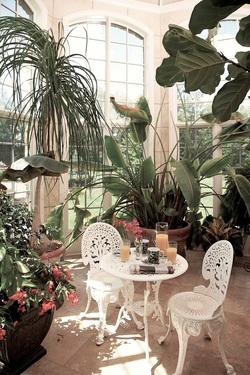 The beautiful morning sun that dapples into the conservatory provides the perfect place to read the morning newspaper and enjoy coffee, while a fountain provides a backdrop of calming trickling water. ​The faux-painted French limestone walls mimic the easy-maintenance French tumbled limestone floors that flow into the gallery hall and foyer beyond. 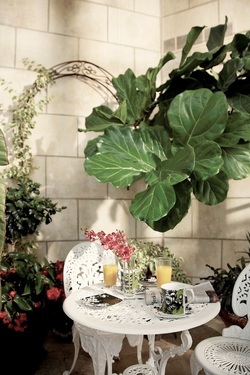 Furniture is carefully edited to allow the plants to take center stage. Classic, traditional design elements take on a chic, modern interpretation in the kitchen of this French-Provencal-inspired country home. Classic white cabinets integrate with the classic-modern custom range hood that anchors the space, with simple white subway tiles for the backsplash. Orange accents splash color into this otherwise neutral room. The kitchen is open to the casual dining area and family room, which visually expands the space. Chestnut-stained wood floors flow through these rooms to integrate the spaces. 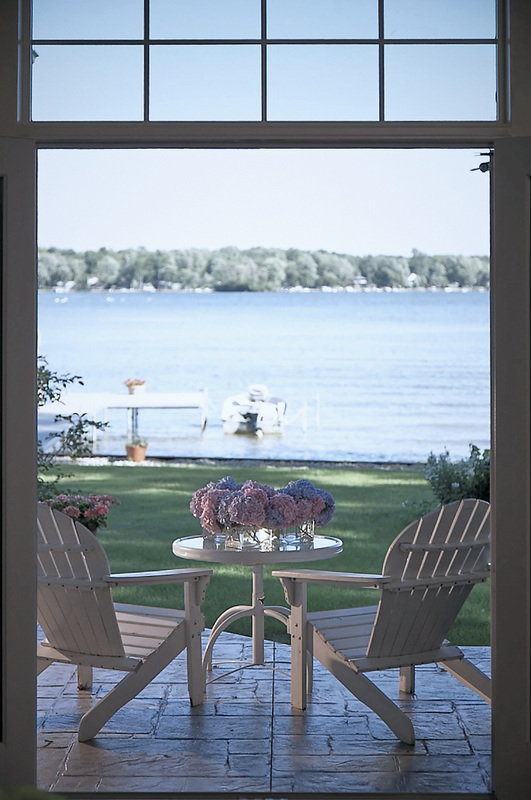 A French door off the kitchen allows direct access to an outdoor veranda for dining and relaxation and provides additional natural light into the kitchen. 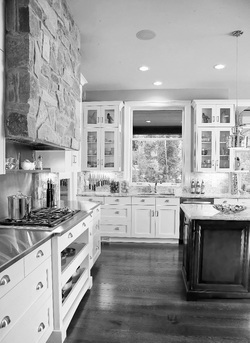 Professional grade appliances assist a gourmet cook, while a pantry off the kitchen provides additional storage. Designed for an owner of a clothing boutique as “her” vacation home closet, this space is organized, inviting, and consistent with the elegant simplicity and calming color palette of this Shingle style home. Custom-built cabinetry drawers and reeded-glass wardrobes organize clothing, shoes, handbags, accessories and jewelry. Dark stained wood floors contrast with the white custom cabinetry creating a clean and warm feel to the space. ​Mannequins enable fittings and add a chic boutique style to the space. The entry doors to the closet are full-length mirrors for dressing. This French-Normandy-inspired all-stone home, and the stone courtyards and landscape gardens surrounding it, were designed to complement each other and to re-create the charm of French/ European villages. The building site was challenging, sloping steeply from right to left, which required an extensive retaining landscape plan to achieve a desirably-sized building envelope for the home without disturbing the drainage on the neighboring lot. ​This challenge was met by creating terraces with stone walkways to lead from space to space, to manipulate the grades while creating a charming ambiance reminiscent of old-world French hill village streetscapes. 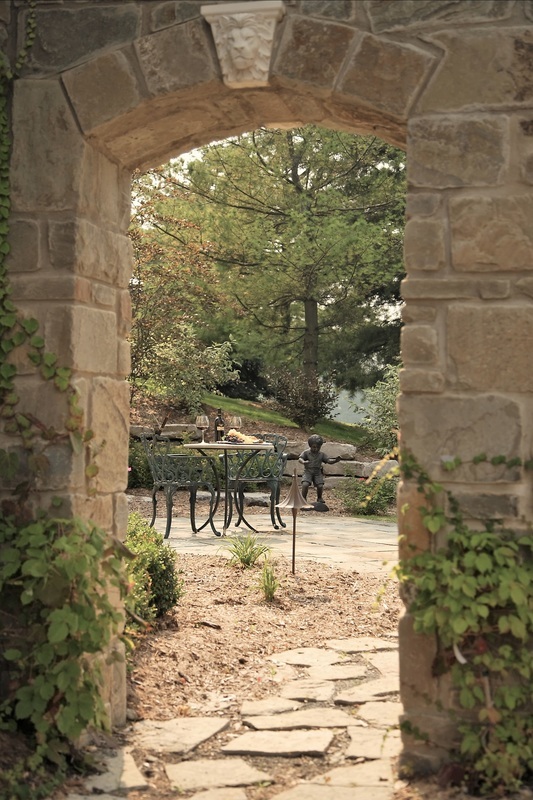 The stone that was used on the exterior of the home was pulled into the landscape design to create garden courtyard walls and garden walk-under arches to add a playful, fun sense of anticipatory space to the overall design. Stone garden pathways meander around the residence, private courtyards are constructed for relaxing and entertaining, and romantic vignettes are created throughout the landscape. The stone was installed on the entire east wall of the kitchen, and a custom range hood was designed to showcase the natural hues and textures of the stone and to anchor the space. The rough texture of the stone juxtaposes with the smooth, commercial stainless backsplash and countertop at the range area and the polished marble installed on the other countertops. The beautiful coloration of the stone, which mirrors the natural hues found in the surrounding environment, lends warmth to this modern, otherwise monochromatic space. The design concept for this space was to create a calming spa-like ambiance with a restrained color palette of soft whites and pastels consistent with the coastal color palette of this Shingle style home. In order to create visual interest, and a modern chic style, a variety of tiles of different textures, shapes and sizes was incorporated into the design. A ribbon of soft gray and brown mosaic tiles with a repeating circular pattern encircles the shower and was placed to move the eye through the space. ​It also plays with the geometric circle shape of the shower itself which is set in a round turret. A smooth pebble floor was installed in the shower and under the free-standing jetted tub to contrast with the smooth marble floor of the rest of the bath. ​Subway tiles are set above the mosaic ribbon, while larger rectangular tiles are set below. The entire sense of space is chic and modern, calming and cohesive. 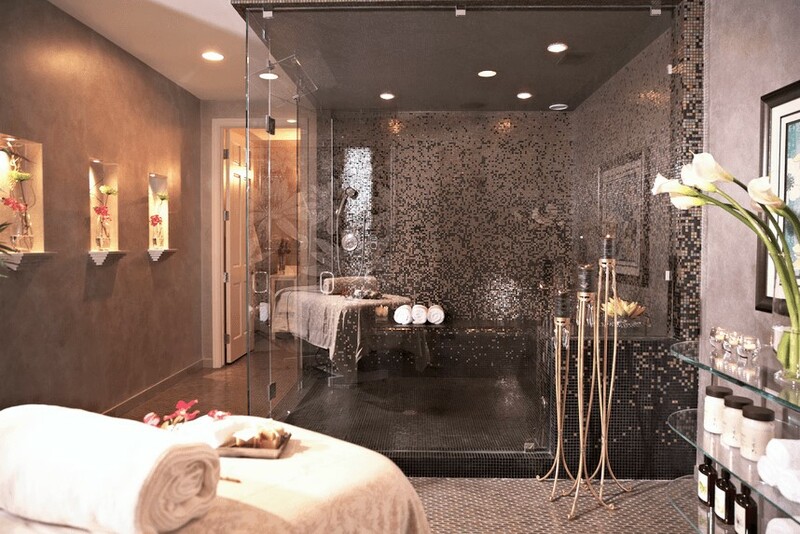 The glistening Sicis Italian glass mosaic tiles installed in this unique spa room create an upscale, tranquil ambiance and are the main feature of this space. 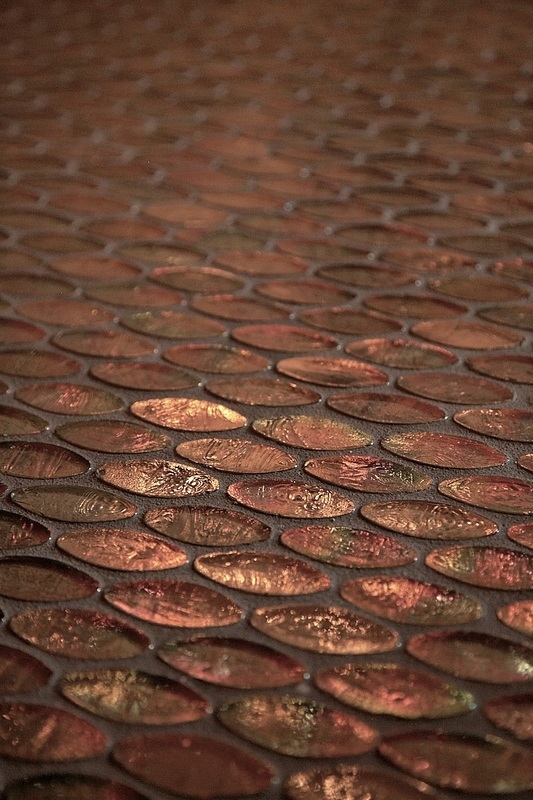 The unique process and artistry of creating the “glimmer-style” Sicis glass mosaic tiles creates a spectrum of iridescent color tones within each tile, and a beautiful reflective movement, and a play of light, when the tiles are installed together. The visual effect is to elevate the overall tile installation to fine art. ​A calming, neutral color palette of topaz, zinc, and brown was installed on all of the floors, and on both the floor and walls of the steam room to imbue a warm, peaceful feeling. 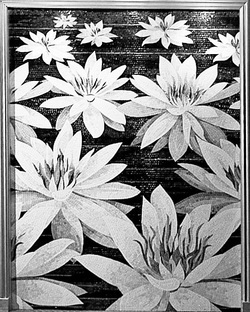 ​An exquisite lotus-flower mural of Sicis glass mosaic tiles, in shades of classic black and white, was installed on the entrance wall of the spa for drama and to reinforce the resort-style feel of the spa space. When light is refracted on the tiles, the white tones shimmer into an iridescent display of grays and pastels, while the black tones metamorphose into deep metallic hues of blue, green, gold, and purple. Inspired by traditional English gentlemen’s clubs, the elegant home theater/ club room of this residence features extensive walnut-stained millwork to create a masculine ambiance which is cozy, warm, and inviting. The paneled millwork is continued on the walls for design continuity, and incorporates speakers and a hidden panel to access the electronics. A resort-style bar is custom milled with a high-gloss epoxy walnut countertop with built-in custom cabinetry to accommodate an under-counter refrigerator, ice maker, fully-stocked bar, and storage for easy entertaining. 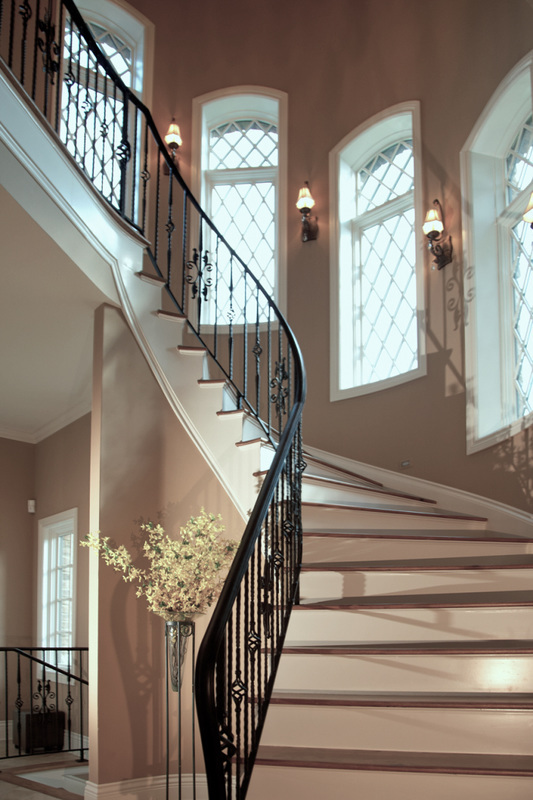 The exquisitely designed and crafted curved walnut stairway, in this European-inspired country home, is an artfully restrained complement to the understated elegance of the architecture of the home. 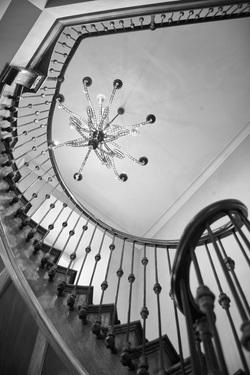 Hand-forged iron ornamental fittings secure the spindles, creating a lyrical repeating pattern as the stairway floats to the second floor. Walnut paneling encases the sweeping underside of the stair. A Venetian crystal chandelier and beautifully patinaed Venetian plaster walls complete the composition. Daylight floods into the mud hall from the French doors and windows. 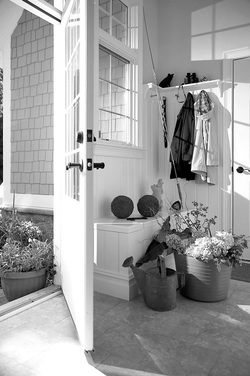 Peg hooks, a built-in bench and his-and-her closets assist in organization. There is direct access to the attached garage as well as access to either the front courtyard or side garden-path to the lake from French doors directly across from each other. A powder room and laundry room are conveniently located directly off the space as well as mechanical and storage closets. This cheerful, lively mud hall is an active space for organizing a busy young family. It can be directly accessed from the garage and the covered side-entry porch. 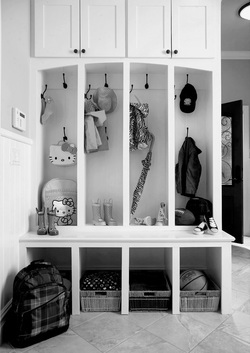 Custom-built, white-painted cubbie-lockers organize coats, boots, book bags, and other necessities for the next day’s activities, while a walk-in-closet off the space stores and conceals additional clothing. Natural daylight streams into the space from the textured-glass-panel wood door off the porch and multiple windows in the laundry room and powder room that are conveniently located off of this space. The wainscoting and trim throughout the space is painted to match the crisp white shade of the cubbie-lockers to create a clean, updated look.